I dental implant is a durable piece of titanium that is surgically affixed to the jawbone. Over time, the existing bone mass will form around the post to form a solid foundation that mimics the natural stability provided by the missing tooth root. What Happens After the Dental Implant is Inserted? Because of the way the dental implant is placed, it requires post-surgery time for the jaw bone and soft tissue to heal, which can take months. After a sufficient recovery, an abutment is added, which is another sturdy piece of titanium that is anchored to the implant to allow a final restoration to be attached. Should You Replace All Your Teeth at Once? Prevents Bone Loss – Your jawbone relies on a healthy amount of tension from the teeth roots to trigger the production of new bone cells. 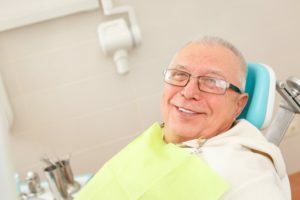 By prolonging the process of replacing all your missing teeth, you run the risk of losing valuable material that could make it difficult to have implants placed in the future. A Complex Procedure – By taking the more proactive route and undergoing a full replacement, the dental implants can be strategically placed to limit the trauma to your jawbone and gums. Angled precisely to provide the most security, the posts allow for the attachment of a full set of implant-retained prosthetics. Fully-Restored and Functional Smile – Another benefit of having all your teeth replaced at once is that you’ll be able to eat all the foods you enjoy, and you’ll no longer have to feel ashamed of the appearance of your smile. The best way to settle any uncertainty is to visit your implant dentist for a consultation, which will allow the professional to examine your current condition to make sure the dental implant process is best suited to meet your needs. By taking this initial step, you’ll soon be able to enjoy a normal life again. For nearly 40 years, Dr. Gary Henkel has been providing precise and compassionate care to his patients. A graduate of the University of Detroit Mercy School of Dentistry, he has since gone on to become an authority in such areas as endodontics, bone grafting and other procedures. Additionally, Dr. Henkel maintains professional membership with the American Academy of Implant Dentistry and the International College of Oral Implantology. He places dental implants at Horsham Dental Elements, and he can be reached for more information through his website.